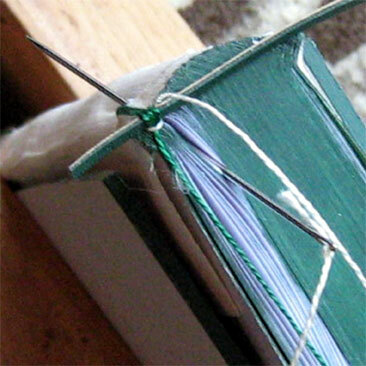 co-ordinate the colours with the rest of the binding. A few weeks ago, I wrote a hand out on how they're made for some fellow bookbinders, so, since I have pictures and text ready and waiting, I thought I'd include them here too. I like to secure the headband with anchor stitches that go through section centres as they lay nice and flat and are less obtrusive. As it can be almost impossible to find the centres of sections when the book is firmly held in a press however, I mark them in advance. Measure off 2 lengths of contrasting thread. Thread 2 bookbinding needles, knotting the thread close to the eye of the needle. 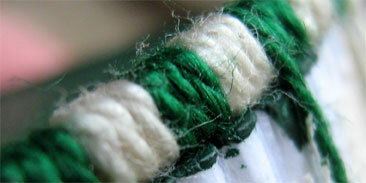 Make a knot joining the 2 free ends of thread together. Cut 2 strips of leather stiffened with manilla. They should be about a tenth of an inch deep and an inch or so longer than the width of the spine. 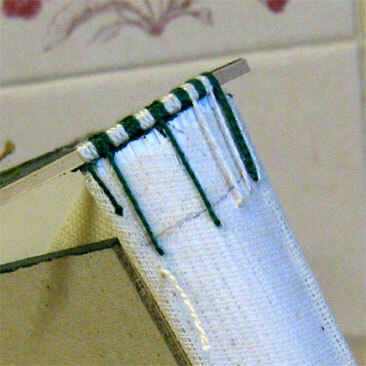 The leather strip should rest on the very edge of the book, creating a smooth extension to the spine. 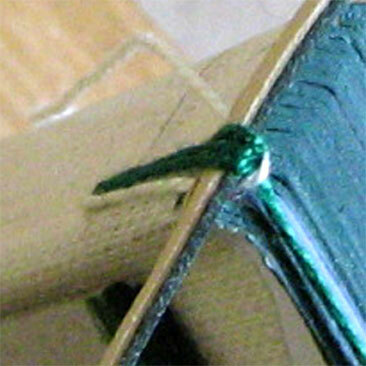 Bring the thread over the leather strip twice more, so that 3 loops are formed round it. Leave the thread at the front of the book. Take the second thread, bring it round and underneath the left hand end of the leather strip, across the 3 loops and back underneath the leather stip. This forms a bead. 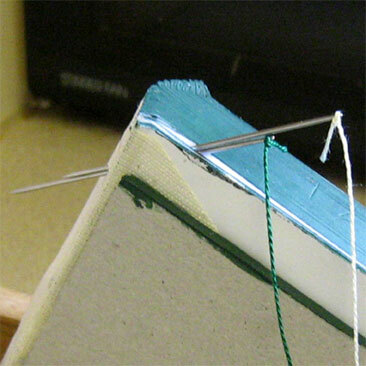 Bring the second thread back over the leather strip to form another loop. 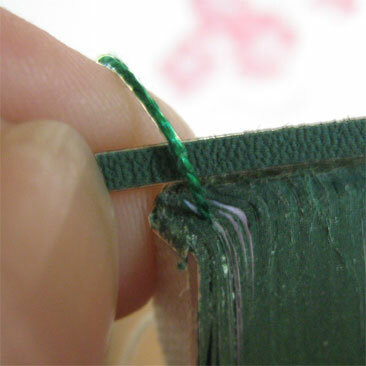 On either the first or second loop (whichever is best positioned), push the needle through the centre of the next marked section and spine, bring it out underneath the first line of stitching. This anchors the headband. After the anchor stitch has been made, continue until 3 loops have been made. 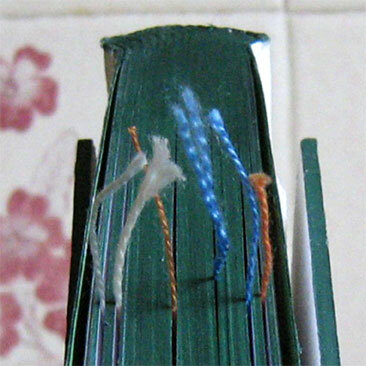 Leave the thread at the front of the book. Take the first thread and make a bead by bringing it across the front of the 3 loops that have just been made and underneath the leather strip, so that it finishes hehind the leather slip. It is now in position to make the next 3 loops. Slot the thread that isnt being used gently between the pages of the book. It should be taut, but not so tight that it pulls the leather strip out of position. 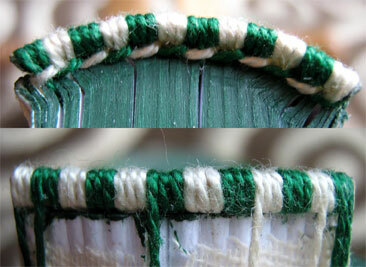 Continue making sets of 3 loops and a bead with alternate colours, inserting further anchor stitches at the markers. 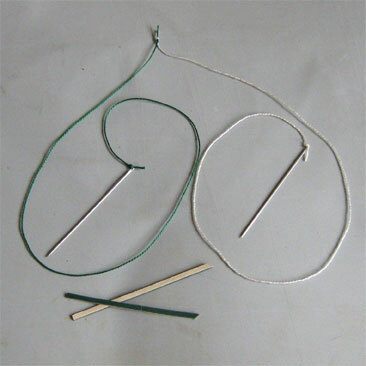 Anchor stitches can only be made on either the first or second loops. This is because the thread always has to finish at the front of the work after the third loop, in order to make the next bead. Be careful positioning the anchor stitches. Check where the very end of the section is. When a book has been rounded and jointed, the sections can curve significantly. In the picture,1 is the centre of a section. At first glance, it is easy to assume that it will finish at 3. In fact, it finishes at 2 and this is where the thread will lie. The anchor stitch should not therefore be made until the headband has reached point 2. 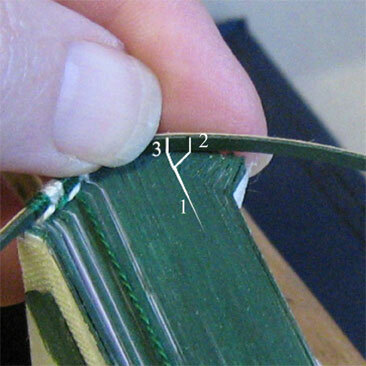 When the final marker at the end of the spine is reached, make the final anchor stitch on the third loop of the last group. Cut the thread leaving approximately half an inch at the back of the spine. 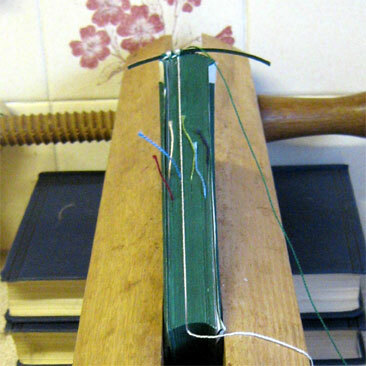 Make the final bead, cut the thread and fasten both ends to the back of the spine with a dab of PVA. 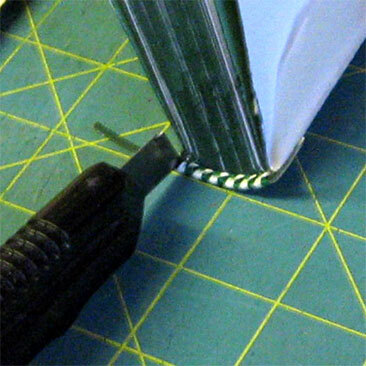 Trim the excess off both ends of the leather strip with a sharp knife. Dab a little PVA onto either end. The finished headband should always be slightly shorter than the width of the spine. This is to ensure a neat finish when the headcaps are made or when the book is cased in.